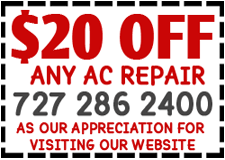 Air Conditioning Service has become highly sought after throughout Dunedin Florida. The downfall of living in paradise is that summer heatwaves can be extremely brutal. Thats why having a reliable air conditioning service is key to your prolonged comfort. Proper maintenance is crucial to save money as we endure drastic climate changes. Indoor Air Quality is important when it comes to the overall health or well being of your loved ones. Routine maintenance including changing air filters and system-wide cleanings, such as to your duct work helps keep your home and family healthy all year round. Dusts, pollen and Pet Dander can quickly build up and these allergens can become a nuisance to family members. Energy Efficiency over time can wear down. Tis can cause your electric bills to skyrocket. Something that consistent maitenance inspections can help reduce long term. Sure you spend a little money through out the year. However, by catching most small problems before they escalate, you potentially save hundreds if not thousands in either, air conditioner repair or full replacement. Seasonal Check ups are crucial as our climates change each season. From hot and humid summers to chilly winters, your air conditioner needs routine inspection to ensure peak performance levels are maintained. For more information, contact us to discuss how Continental Cooling and Heating can assist you with our honest and dependable air conditioning service.